Whether you’re an artist hoping to profit from your own creative ideas, a business owner with the desire to market your brand, or even just someone with a fun idea for a single t-shirt, Print Aura can help you turn ideas into marketable products. 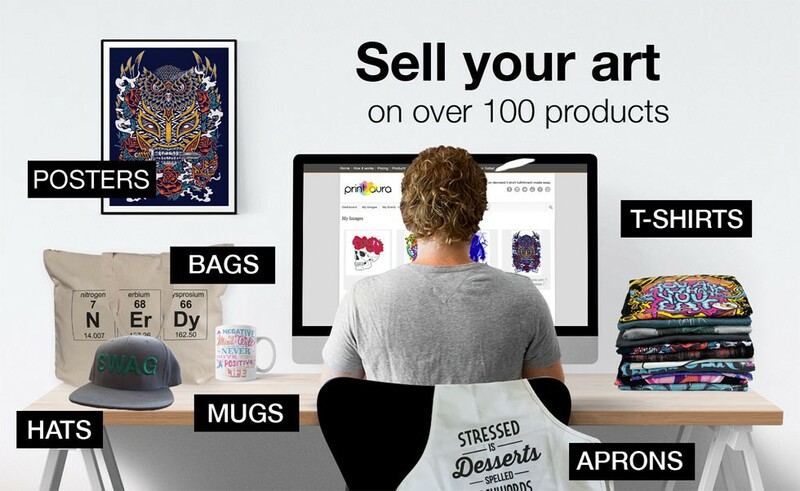 Print Aura is an on-demand, white-label, drop-shipping solution that will turn your ideas into products under your very own brand! Partner with Print Aura, and let us take care of the logistics for you so you can focus on what you love. A customer buys something from your store, and you get paid! Print Aura is automatically sent the order and customer info. We prep, print, and ship the order to your customer under your brand. You sit back and enjoy the rewards, knowing Print Aura is on the job! Don’t let logistics stifle your creativity! Let Print Aura simplify the process of online selling for you! 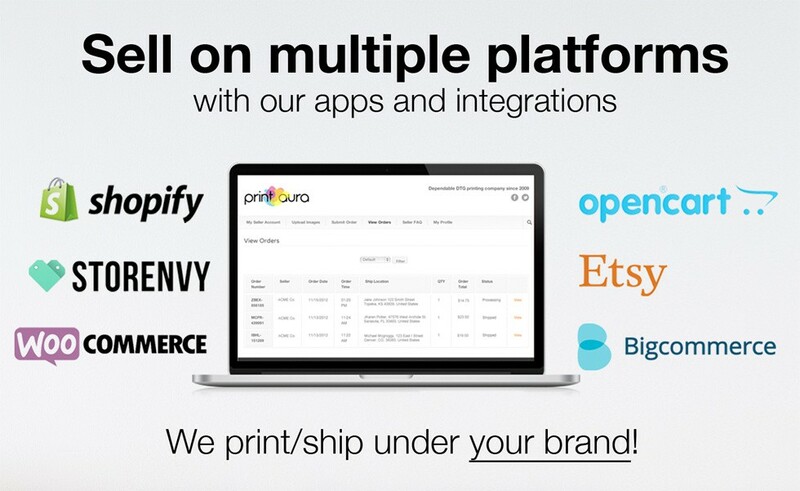 Join 15000+ independent designers, companies, non-profits and entrepreneurs who are members of Print Aura. We have no order minimum requirements. You can just order one t-shirt with no setup costs. Everything is printed on demand. Choose from 100+ different garments in tons of brands, colors, styles and sizes. We also offer mugs, bags, cellphone cases, hats and more. Check out our prices for products, printing, shipping and t-shirt fulfillment. There is NO minimum order, only pay for orders that are submitted. No membership fees. Standard order processing is 3-5 business days. Expedited processing available for 48 hour turnaround times. If you can send it to us we can print it. Whether it is 1, 25, 50, 100, 500 per day. We print with some amazing Kornit DTG printers. 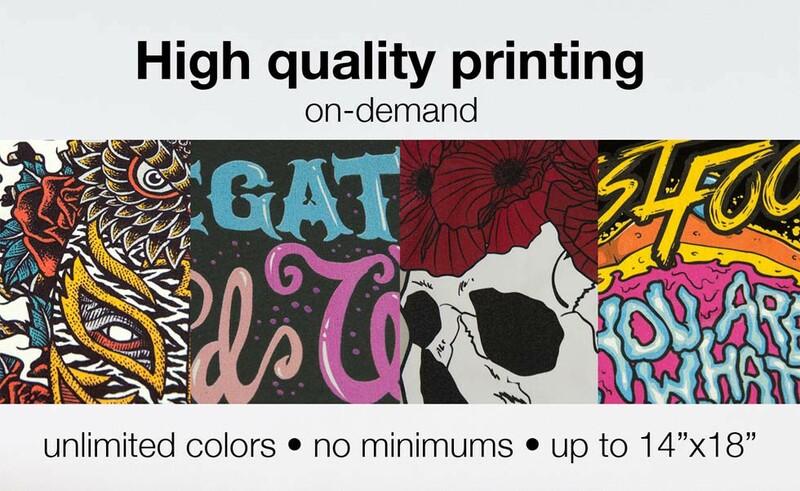 We print t-shirts in full color using Direct to Garment technology with standard t-shirt prints at 12"x16" and oversized printing up to 14"x18". We guarantee our products to be free from defects due to printing or manufacturing errors. If we make a mistake, we will pay to replace it. Yes! We do care about your brand and we respond quickly to help with all your t-shirt fulfillment questions. Easy to design with the mockup tool. Great selection of brands *and* more design choices than other places that I researched. Shipped quickly. Received quickly. Order was perfect. Shirts absolutely gorgeous! My relationship with Print Aura begins! Excited To Have Found Print Aura! We are just starting up our biz and have ordered a couple of our designed tees. We loved them! We are so pleased and excited to have found PrintAura. Exceptional quality and service! Received part 1 of my order today from Cheryl my Support Rep over at Print Aura. And I will say her support has been top notch, great customer service. Can't wait for the second part of my order. Great Job - Print Aura! The BEST T-shirt Printing Service! An Awesome Addition To Our Business! We are very satisfied. Customer service is responsive, and feed back from our customers is very good. They are great about getting orders printed and shipped very quickly. Print Aura has been an awesome addition to our business. Highly recommended! No membership fees, no minimum order. We print/ship t-shirts under your brand. It's super easy with no risk.